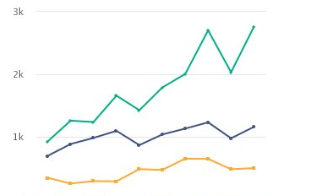 I welcome the CSO’s (Central Statistics Office) New Dwellings Completion Report, which confirms a strong upward trend across all housing construction activity data sets. 4,419 houses were completed in the second quarter of 2018. So far this year almost 8,000 new homes have been completed. While we still have some way to go, more homes have been completed in the first six months of this year than in any year between 2011 and 2016. So that is really welcome progress. Our fundamental task is to increase supply and these figures confirm that this is happening, and quickly. This housing crisis is deep and affects people’s lives in so many ways, from people in emergency accommodation, to those struggling to pay the rent or afford their own home. But the primary solution to these problems is supply. The message from today’s CSO report is clear. The ongoing efforts by my Department, relevant agencies, local authorities, Approved Housing Bodies and other stakeholders to deliver on the goals of Rebuilding Ireland is bearing fruit, but we will not become complacent and will continue to work together to tackle the issue of housing supply. For full information, go here. 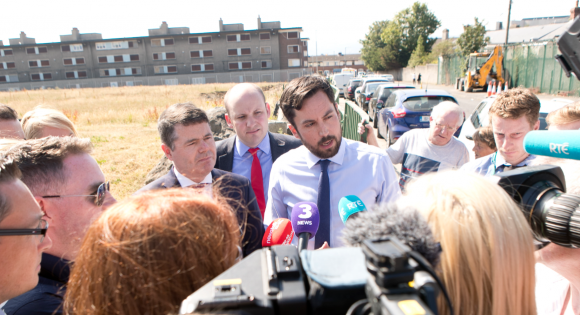 Last week I announced that a Dublin City Council-owned site at Emmet Road in Inchicore has been selected as the location for Dublin’s first major Cost Rental development. 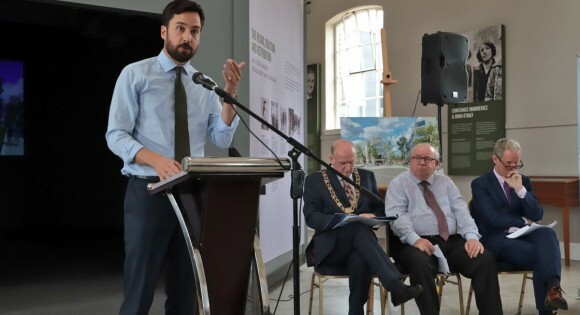 The Chief Executive of Dublin City Council, Owen Keegan has welcomed plans for the council to lead out on the development. It is expected that the detailed proposal for the site will be brought before the Council in September for approval. The entire development will be managed as a single integrated community, by a professional estate management company, which will also be competitively procured by the Council. 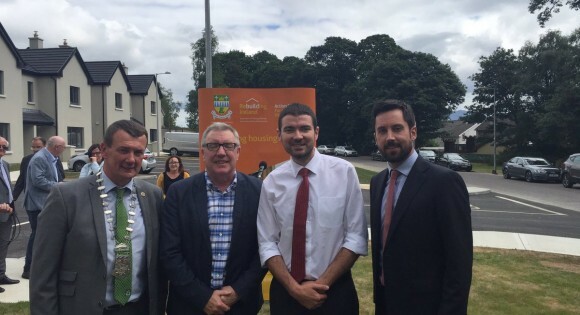 On Tuesday I opened a new 20-unit social housing scheme in Killarney. 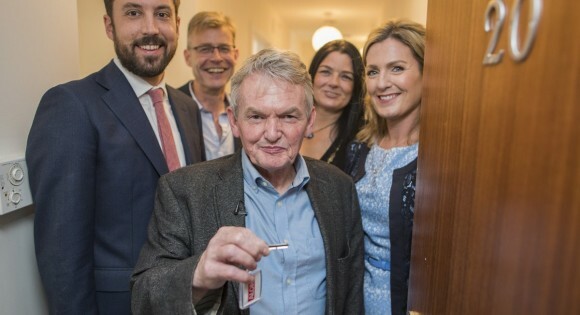 The €3.1m scheme of two-storey, three-bedroom units will provide homes for families currently in need of accommodation in the Killarney area. Construction began in February 2017 and tenants have moved into the new homes last week. I saw that the development has been designed and built to a very high standard. I understand there is an already vibrant community spirit in this area and the new residents there, in the new estate, will add to that. To continue reading, go here. To see a short video from the site, go here. We also traveled to Kenmare where we visited 22 new social houses that are under construction. Last week I officially opened the latest housing project by Carlow Voluntary Housing Association Ltd (trading as Tinteán), in partnership with Delta Centre in Carlow. It is a landmark project – the first group home for people with disabilities designed and constructed to Passive House standards. It has been built on an existing site with an existing special needs home and has been designed to create a shared, private area between the two homes. The house will serve as a home from home for elderly special needs tenants with care provided by Delta Centre. This Government recognises the serious challenge we face in terms of housing and a critical focus and priority has been firmly placed on responding to this challenge through the development and implementation of the Rebuilding Ireland Action Plan for Housing and Homelessness. It is critical at this stage to ensure that all the structures already in place are aligned, co-ordinated and co-operating towards a shared vision. This includes the Department, the Housing Agency and the Housing Finance Agency working with local authorities and Approved Housing Bodies across the country. Local authorities and Approved Housing Bodies working in partnership is a model that the Department encourages, and this scheme here today highlights the real progress on the ground being achieved to address the challenges we face in the housing sector. To watch a short video from the site, go here. On Thursday I announced details of a €2 billion Urban Regeneration and Development Fund. 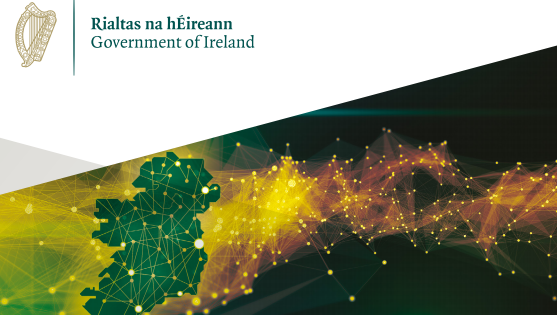 As a key part of Project Ireland 2040 – the Government’s National Planning Framework and National Development Plan – the fund is intended to drive regeneration and rejuvenation of strategic and underutilised areas within Ireland’s five cities, key regional drivers and other large towns. 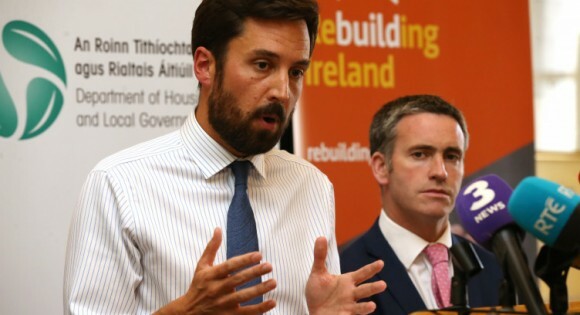 The fund is one of four such funds established under the National Development Plan 2018-2027 and the Department of Housing, Planning and Local Government (DHPLG) has responsibility for implementing the fund, which has €100m available for expenditure in 2019 and an overall allocation of €550 million allocated to the fund up to the end of 2022. This fund is about backing better and more coordinated planning for future generations in a way that meets the needs of our growing population and economy more sustainably, by re-imagining and turning around the all-too-frequent sight of empty or run-down or poorly utilised areas in the centres of our cities and larger towns. With this fund, we can now choose a better way to live and work and enjoy leisure time and go for real quality of life and make quality places rather than creating more commuting and urban sprawl. To watch a short video about the fund, go here. Yesterday we turned the sod for the development of the first phase in the Regeneration of O’Devaney Gardens in Dublin. 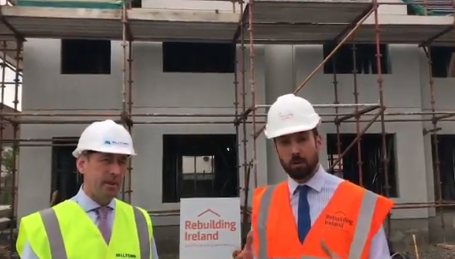 The first phase will deliver 56 social homes with a budget of more than €20million. The overall re-development will deliver approximately 600 homes, with a mix of tenures, social, affordable and private homes. Under Rebuilding Ireland, the Regeneration of O’Devaney Gardens is a Pathfinder project, showcasing the provision of large scale, mixed tenure housing in an inner city setting. It is one of three development sites that Dublin City Council owns and offers the combined potential to provide over 1,600 homes. These sites offer the opportunity to create three new, high quality urban quarters. The other two sites are at St Michael’s Estate in Inchicore and at Oscar Traynor Road in Coolock. I am delighted to turn the first sod on these new homes for tenants of Dublin City Council. It is also a good day for the regeneration of this area. Regeneration goes beyond mere bricks and mortar and in order to be successful and sustainable in the long term, requires the re-building of a community and a strengthening of community bonds. These new social homes will be built to the latest standards and the highest quality and I’m sure the tenants will be delighted with them when they are finished. Arrangements are well in train to complete the development of the remainder of the site. To see a short video from the site, go here. Following the conclusion of our third Housing Summit with the Chief Executives of each of the 31 Local Authorities today, I am announcing a number of key outcomes and actions that were agreed to further accelerate and increase the delivery of social and affordable housing. Preventing homelessness, as well as ensuring that those who are experiencing homelessness have every support they need, were also a key focus of the Summit. 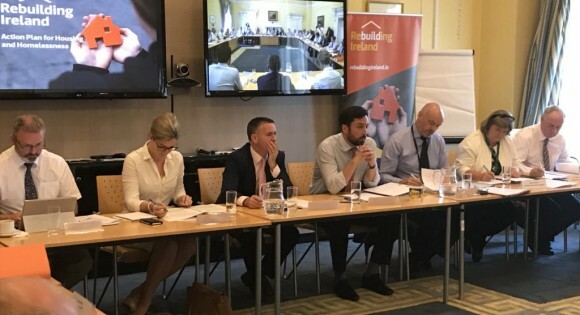 In particular, the need to exit families and individuals from hotel and B&B accommodation into tenancies supported through the Housing Assistance Payment (HAP) scheme or into family hubs, where a range of important supports are in place, was also re-emphasised as a key priority. The role of the Approved Housing Body (AHB) sector, partnering with local authorities, is critical in terms of delivery. Of the 50,000 social housing homes to be delivered from 2016 to 2021 under Rebuilding Ireland, the AHB sector will deliver a third of these. 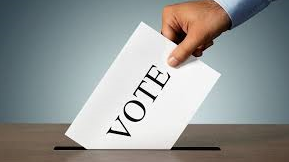 To find out about the key outcomes and actions that were agreed, go here. To watch a short video about the event, go here. Recently I published two new reports received in relation to homelessness, one prepared by the Dublin Regional Homeless Executive, and one prepared by the Inter-Agency Group on Homelessness. I very much welcome these two separate reports on homelessness. The report from the Dublin Regional Homeless Executive was one I requested earlier this year to investigate and help the Government develop more responsive policies to some emerging trends in homelessness.